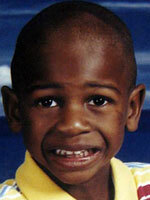 Adji Desir has been missing from outside his grandmother's residence in Immokalee, Florida, since Saturday, January 10, 2009, at approximately 5:30 p.m.. Adji reportedly went outside to play with neighborhood kids after dinner. Adji Desir has been missing from outside his grandmother's residence in Immokalee, Florida, since Saturday, January 10, 2009, at approximately 5:30 p.m.. Adji reportedly went outside to play with neighborhood kids after dinner. He was reported missing a little while later and his whereabouts remain unknown. Adji was last seen wearing a blue and yellow t-shirt, blue and yellow shorts, and black and gray sneakers. He is mentally handicapped and functions at a two-year-old level. He has very limited vocabulary and is non-verbal. The FBI is offering a $10,000 reward for information leading to the recovery of Adji Desir. Southwest Florida Crime Stoppers is setting up a separate account where residents can donate towards a reward for information leading to Adji Desir's whereabouts.